College is a time to find out and celebrate who you really are, and a list of student organizations will tell you as much. College Democrats, Black Student Alliance, Adventist Christian Fellowship—universities are crawling with student groups designed to bring together people with similar interests, opinions or heritage. But beneath the clubs and organizations there lays a silent minority, a group that can’t speak up or embrace who they are. They walk the halls like everyone else, struggle under the weight of the same workloads and live in the same dorms. But hanging over their head at all times is a threat most college students would never need to consider—the threat of being forcefully removed from the country in which they’ve lived most of their lives. These are undocumented students, and if they are pursuing higher education, they’ve already beaten the odds to get there. But that doesn’t make university life any easier. Around 65,000 undocumented students graduate from United States high schools every year, according to the Ford Foundation. Of that group, about 6,500 enter universities. But getting into a university isn’t even half the battle; a myriad of challenges await undocumented students upon their admission. According to a Ford Foundation study, which was conducted at 28 Jesuit schools across the country including Loyola University Chicago, 60 percent of staff members at the polled institutions think educating undocumented students should be an institutional priority. Loyola University Chicago, however, has spent recent years developing a “network of support and advocacy” for undocumented students, according to Jason Chan, a program coordinator at the Loyola’s Department of Student Diversity and Multicultural Affairs. One of the main areas of focus has been raising awareness around Loyola. The Department of Student Diversity has teamed with the Center for Urban Research and Learning to develop a training program for faculty and staff (and soon, Chan noted, for students) focusing on the needs, issues and challenges of undocumented students. “In order to support undocumented students, it’s important for the campus community to be aware of what the experiences of undocumented students are,” said Chan. Loyola has been a vocal supporter of rights for undocumented students for years. University President Michael Garanzini and Vice President for Government Affairs Phillip Hale both released statements in 2011 in support of the Illinois Dream Act. “We hope to create a campus climate that undocumented students believe is welcoming and supportive of them, and which can appropriately and effectively assist them in navigating and addressing challenges that may arise due to their status,” said Chan. Meaningful legislation that addresses the problems facing undocumented students has been scarce and unsuccessful. Various forms of the DREAM Act, a bill which would give undocumented students residency if they meet certain conditions, have been floating around Congress since 2001. But none have gotten so far as the President’s desk. Illinois, however, is moving forward without the federal government’s help. 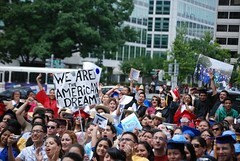 The Illinois DREAM Act was signed into law in 2011, and goes farther than have any of the federal versions of the bill. The law created a DREAM fund commission to raise money for scholarships and pre-paid tuition programs for undocumented students. The commission’s other mandate is to conduct research on the barriers and challenges for undocumented students pursuing higher education. The law also makes undocumented students eligible for the state’s various college savings programs, such as Bright Start and College Illinois. The programs were previously only open to students with social security numbers. Now, the only requirement is a Individual Taxpayer Identification Number—so any taxpaying undocumented student is now eligible for the programs. Still, the ability of Loyola to help the undocumented student population is only as good as the funding for these operations. And, as Chan noted, funding is scarce. Click through the slideshow below to see the key ruling and legislative actions that have increased access to education for undocumented students, nationwide and in Illinois. 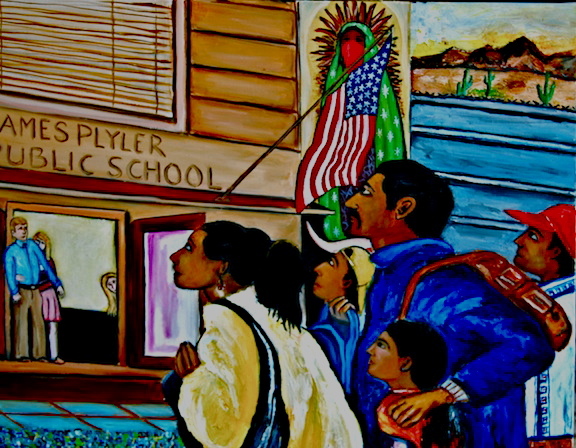 Plyler vs. Doe was a 1982 Supreme Court case that struck down the states’ ability to pass laws denying public schooling to undocumented students. The Justices ruled that any law denying undocumented students’ ability to get a public education was a “discriminatory burden on the basis of a legal characteristic over which children can have little control". The ruling only applies to K-12 education. Painting by: Christian Faltis, Professor at UC Davis’ School of Education.